Commander Security Forces – Jaffna Major General Mahinda Hathurusinghe attended the inauguration of clinic as the Chief Guest. This medical camp was sponsored by the Atchuvely Lions’ Club for the second time. During such clinic conducted by the 511 Brigade with collaboration of the same medical team last year, 21 year old Kajenthini, 3 year old Apisha and 3 year old Santhus were found to be suffering from acute heart diseases. 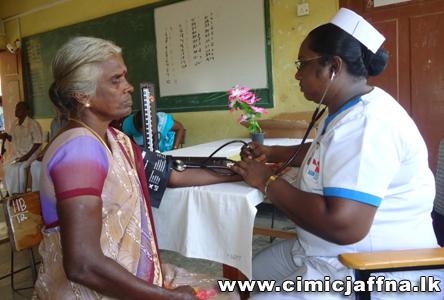 Hasty arrangements were made by the Security Forces Headquarters – Jaffna to fly them to Asiri Heart Care centre where the surgeries were administered on priority basis. Opening ceremony of specialized medical officers’ quarters at District Government Hospital, Mullaitivu was held on 10th August 2013. This will necessary facilities to the doctors to serve more patients staying at the hospital. Mullaitivu Regional Director of Health Services Dr.A.Thileeban headed the event. Governor of Northern Province GA Chandrasiri participated as the chief guest and declared open the building. This 3 storey building consisting of 6 units was constructed at a cost of 40 million rupees with the American government financial support. Secretary of Provincial Health Ministry R.Raveenthiran, Medical Superintendant of Mullaitivu DGH K.Shanmugarajah and other relevant officials took part in the event.